As an historical romance author, a big part of my job is research. Of course if you’re writing any genre, research will be involved. But with many readers quite savvy on what was, and was not, done or used in the past, the historical author has more of a challenge. Since I was a History major in college, research for me falls into the category of ‘fun.’ My biggest hurdle is how lost I become in history when I’m researching. Stories of battles won and lost, nations conquered, and all the usual stuff you get in high school history held no interest for me. It was only when I began reading historical fiction that I became a history aficionado. When I began my Marriage Mart Mayhem series, the first two books (The Elusive Wife and The Duke’s Quandary) were set in London, during what is called the Season. That is where young ladies try to snag a husband, where their mamas turn into eagle-eyed huntresses on behalf of their young daughters, and the gentlemen attempt to avoid all of that for as long as possible. But, alas, duty eventually calls and the gentlemen must marry and set up their nursery. After all, those titles must be passed down. The next two books (The Lady’s Disgrace and The Baron’s Betrayal) took place in the country, for a change of pace. There life was a bit different, more relaxed, and without the frantic pace of London. All of that was easy to research because so much has been written on the time period and England. There are plenty of resources for life in the country and small villages. 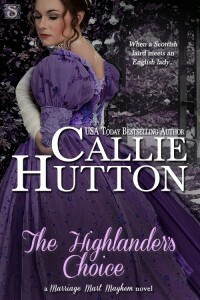 The books that followed (The Highlander’s Choice—July release, and The Highlander’s Accidental Marriage—November release) posed more of a problem. There is a great deal of information on the Regency time period, but almost none about Scotland at the time. This was after the Battle of Culloden, and the dreadful Clearances that followed, where so many Scots were thrown off land they’d lived and worked on for centuries. Very little in the way of history is recorded about that time. Most Scots probably busy packing to emigrate to America. The final book in the series (The Abandoned Bride) will take place in Regency era America. I don’t expect to have too much trouble finding history for that book. I just hope I don’t spend more time reading about how to make Johnnycake, or spin wool, than I do actually gathering facts for my genteel lady who arrives from England in search of her missing husband. Our heroines get BRAZEN with their heroes! Book trailer for Olivia Twisted by Vivi Barnes is up on Hypable today!